I love Halloween, and I love the idea of things like ghost stories. But, I think I have quite an overactive imagination... so things like haunted houses to visit at Halloween, etc. always really scared me as a kid (often way out of proportion). But, I loved costumes and trick-or-treating. I went trick-or-treating with friends all the way until I was a senior in high school. It was always fun. And, my Mom was really good at helping me make costumes. 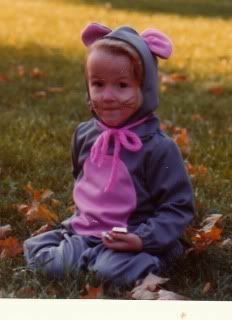 Not too long ago she emailed me some scans of old photos of a somewhat random selection of my old Halloween costumes. Thought I'd go ahead and share them. 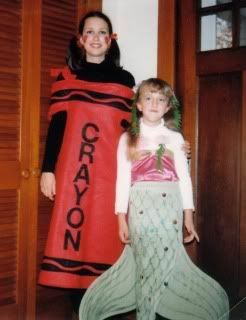 (that's my Mom in the crayon costume... and this was one of my all-time favorite costumes. I went through a phase when I was obsessed with mermaids. 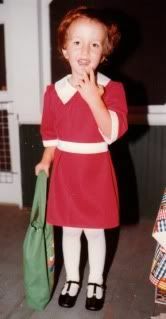 The Little Orphan Annie costume above also represents one of my childhood obsessions... *Loved* Annie). (This is from when I was a little older). how sweet is this, its beutiful Amanda. I am sure you got a lot of candy. What a cool Halloween party, Chrissi. She's pretty handy with an eye-bowl, though. This isn't a memory, but Halloween themed. OMG! If these people were my neighbors, I'd have to shoot them! Before you shoot them, Chuck, make sure they've turned that machine from hell off!!! Otherwise it may play on and on and on for EVER!!!! !